Colombo - Sri Lanka's cricket board on Wednesday fined captain Dimuth Karunaratne $7 000 after he was arrested for drunk-driving, with the player also ordered to stand trial next month. Karunaratne, 30, has apologised for his "unbecoming" actions after he was detained for crashing into a three-wheel taxi on Sunday, leaving its driver injured. "Sri Lanka Cricket decided to impose a fine of $7 000 on Dimuth Karunaratne, after the player was found to have violated the 'Player Contractual Obligation,'" the board said in a statement. However, the board will take no further action as he had maintained a "very high professional standard as a player". 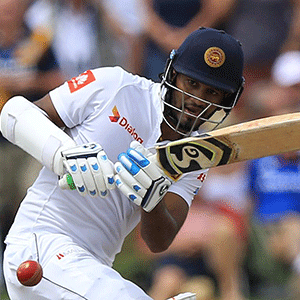 A magistrate has suspended Karunaratne's driving licence and fixed a trial for May 2. The cricket star was also asked to take a medical test. Police told the court that Karunaratne went through a red light and hit the taxi whose driver was hospitalised for minor injuries after the pre-dawn crash. "My actions were utterly unbecoming of a Sri Lankan national cricketer and I do apologise to all of you for this incident," Karunaratne said in a statement on Monday. The incident came as Sri Lanka decides who will be captain for the national team at the Cricket World Cup starting in England on May 30. Karunaratne, who led Sri Lanka to a stunning Test series victory against South Africa last month, had been one of the favourites for the position.